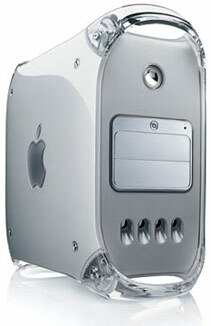 I must admit I have a bit of a soft spot for the G4 MDD (Mirrored Drive Doors), not only is it one of the best looking towers produced by Apple, the 1.25 Ghz version was also the last G4 model produced that was could still boot in Apple’s older Mac OS 9. This made it especially popular with users who still needed to run applications that couldn’t run in Mac OS X. The MDD’s range included models with dual 867 MHz, 1.0 GHz and 1.25 GHz processors, the last of the MDD models had a single 1.25 GHz processor but could also be configured to come with dual 1.25 GHz processors. Apple also produced three G4 PowerMacs sharing the same MDD casing, though these are referred to as FW models - the FW coming from the single Firewire 800 port that was introduced on these models. Unlike the true MMD PowerMacs, the Firewire's can’t boot in OS 9, they were available with 1.0 GHz, 1.25 GHz (x2) and 1.42 (x2) GHz processors. I used a 1.25 GHz dual processor MDD for a couple of years in my job as a web designer. The company had about 6 of those Macs and although most of them were replaced with G5 PowerMacs, at least 3 of them are still in daily use. I honestly can’t recall having any major problems with the MDD that I used, it was probably on 24hrs a day, 5 days a week, only shutting down at weekends. On the odd occasion the fans would suddenly become extremely loud for a few minutes and then return to normal, it probably only happened once or twice a month and was probably more down to being on in a warm office with poor ventilation all day. Thanks to an easy to access interior it’s relatively simple to upgrade these models with bigger or second hard drives and all the MDD models can be fitted with a maximum of 2GB of RAM - which is quite impressive for models up to 5 years old. With enough RAM MAC OSX Leopard should run at decent speeds on all of the MDD range, though for ultimate performance it might be best to stick with MAC OSX Tiger. You can buy RAM for the MDD range from crucial.